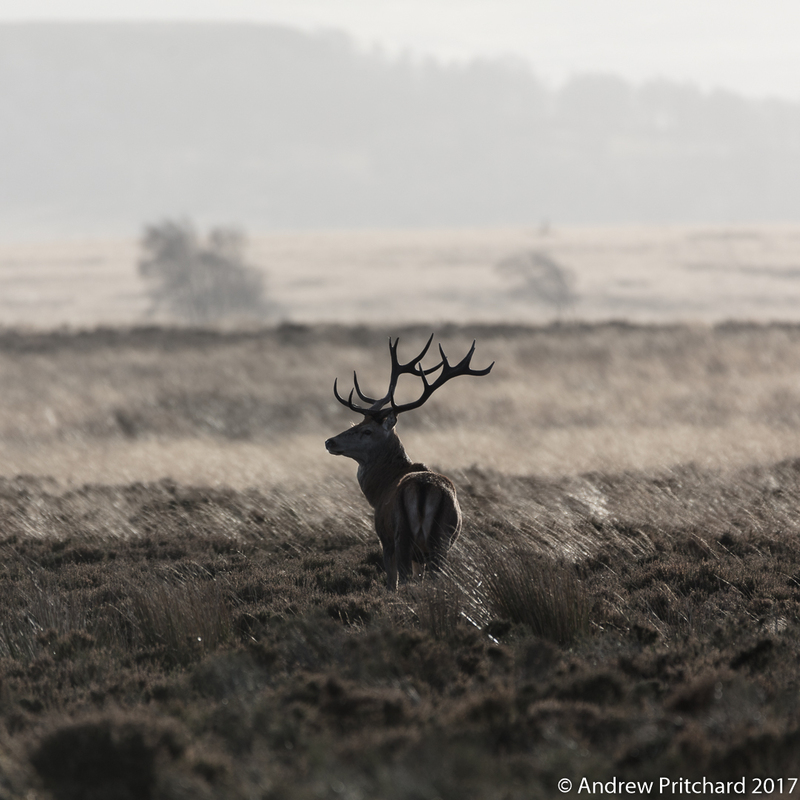 Early morning on the moor. 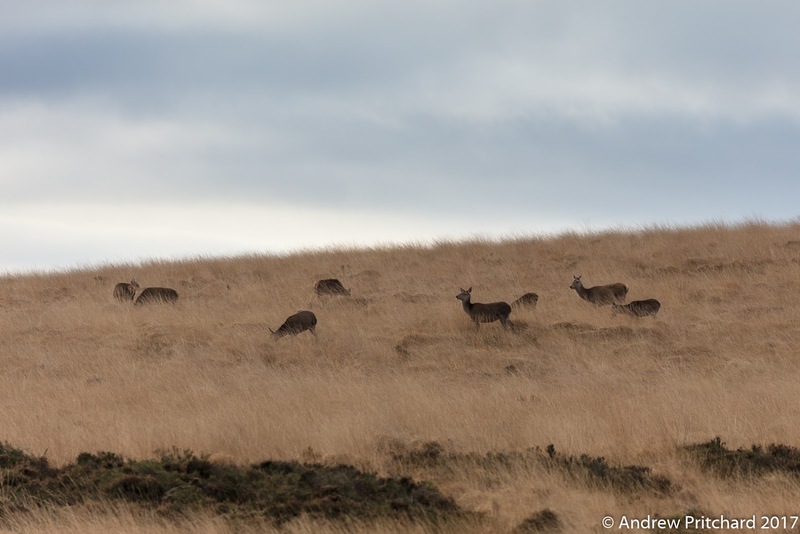 A group of deer are feeding on the long yellow grass on a moorland hillside. Not far from the footpath used by humans, dogs and other animals, they are quite used to seeing people walking nearby. Some things are too disturbing for them though. The feeding deer are interested in the people walking or jogging along the footpath. They look perturbed by something, perhaps the people nearby. Or maybe someone approaching? Disturbed by a jogging dog. The deer see a dog running along the nearby footpath with it's jogging owner. Only a small dog, but a dog off the lead can run anywhere it likes. In the wild, the main predator of large red deer would have been wolves, and probably still is in mainland Europe, where wolves can still be found in the wild. In England though, the nearest thing to a wolf is a pet dog! In search of different feeding grounds. Down on the flat area of grassland below the edge, a stag wanders, seemingly on his own. 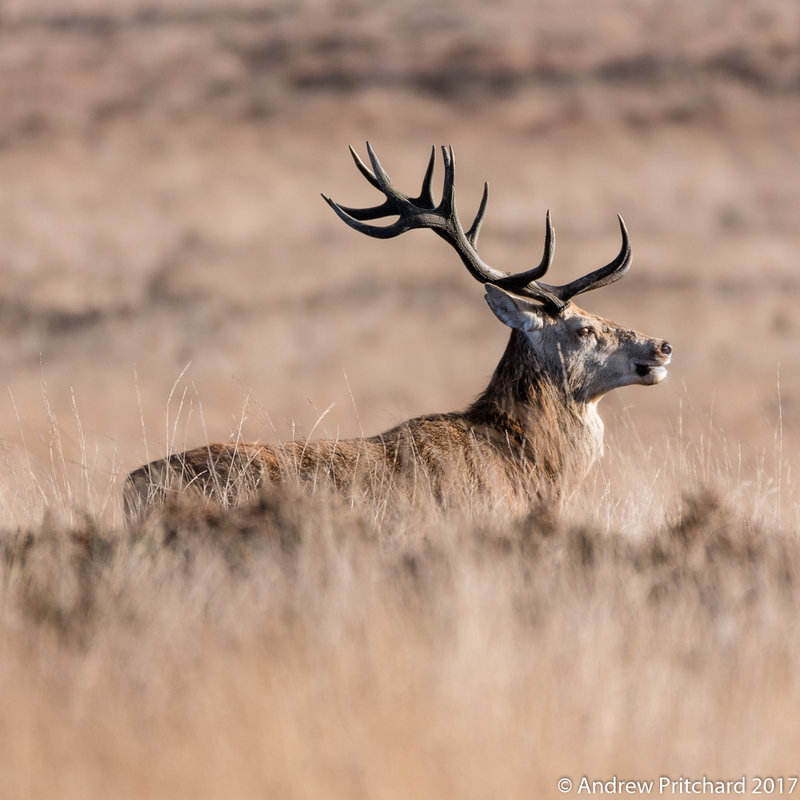 It is December, and stags are still seen to be maintaining their harems, perhaps the hinds can still be receptive to mating, even in the Winter months. 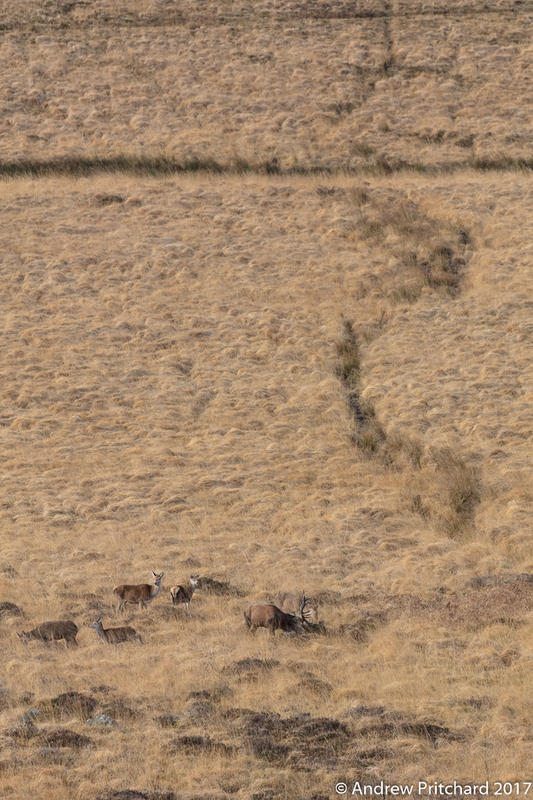 Nearby a group of hinds are also wandering across the grasslands. Not far from the stag a group of hinds is also walking across the grass. The stag is not on his own then, preferring to walk some distance behind the hinds. 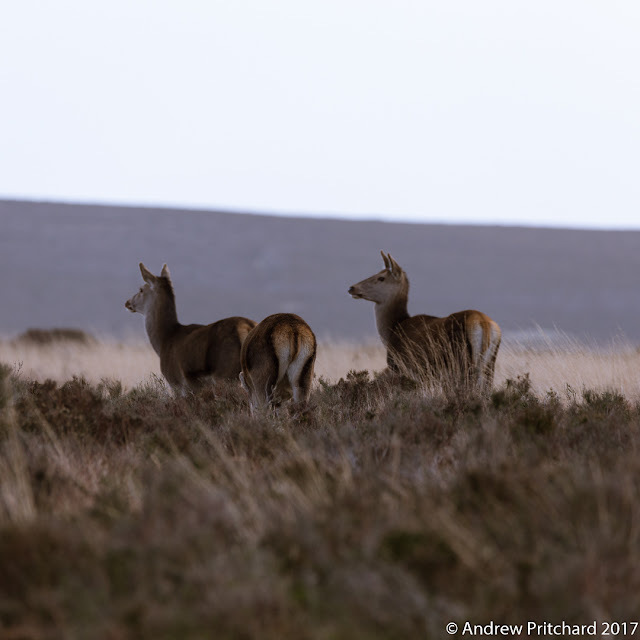 The deer may have been making their way up onto the moorland to graze on heather during the day. 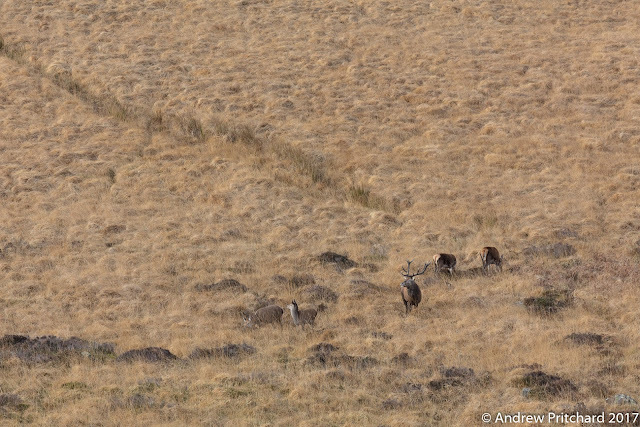 The stag rounds up the small harem seemingly in preparation for crossing the boggy grassland. 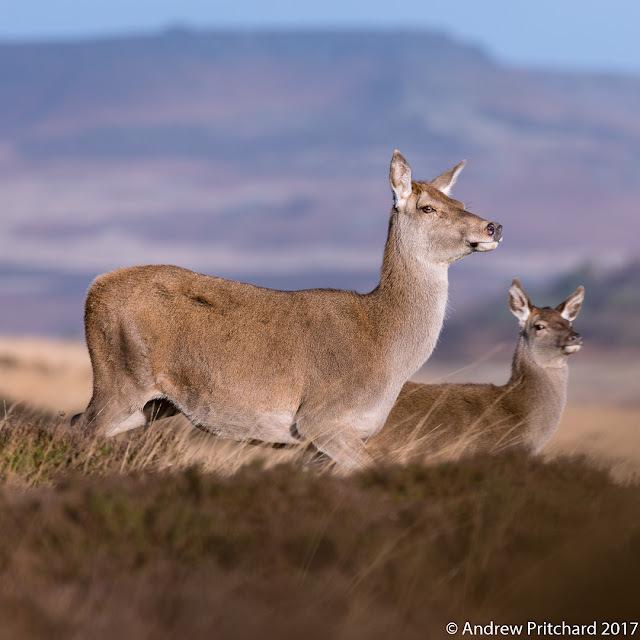 If there are too many humans already on the edge of the moorland for the deer to feel safe to move onto the moor, they may prefer to stay down on the more grassy area. There are still areas of heather further across the flats, but they must cross the boggy area first. The stag is interested in a nearby stone, possibly eating the lichen off the rock. The ground here is littered with gritstone boulders that have fallen from the edge above, and then gradually been moved downhill over thousands of years of freeze thaw action. The path of the deer can be seen cutting through the grass, as if they have already come this way. The stag stares back in the direction the group of deer has come from. Perhaps there are stragglers that need to be rounded up before crossing back over the wet ground? 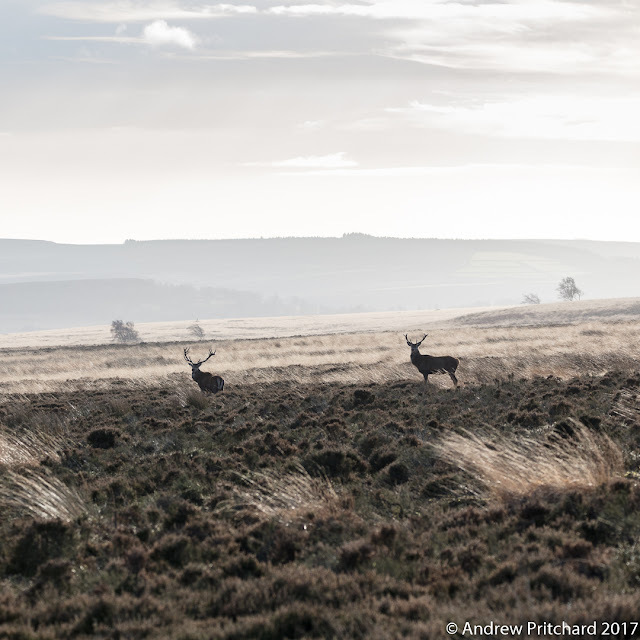 The early morning lure of the moorland has not proven strong enough to entice the deer past the humans. 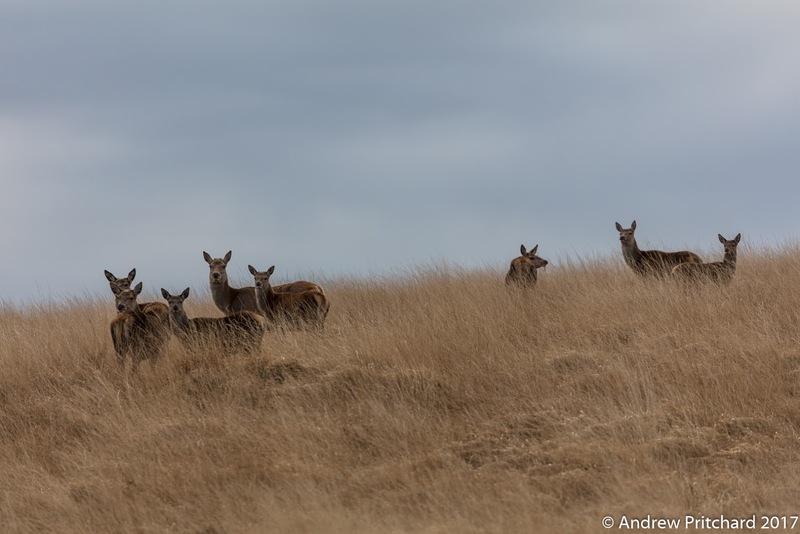 During the previous months of the rut they would be less timid! A good roar should hurry up any stragglers! The stag roars, as if to hurry up the stragglers from his harem left behind. Even whilst moving, the deer are feeding as they go. If they can't get to the heather, the yellow straw like grass makes a good second choice. Dried grasses will do if there is no evergreen heather or even lichen nearby. I know you are there, human. 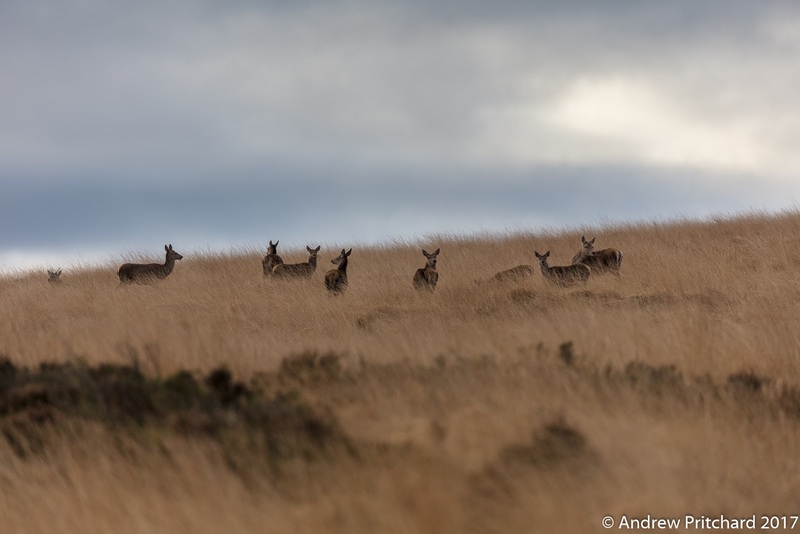 A stag standing in tall yellow grass stares forwards, surrounded by hinds grazing. The heather and grass form light and dark bands below the near horizon, looking a little like burning coals. A person could imagine they were witnessing something more than deer on the moors seeing a scene like this. 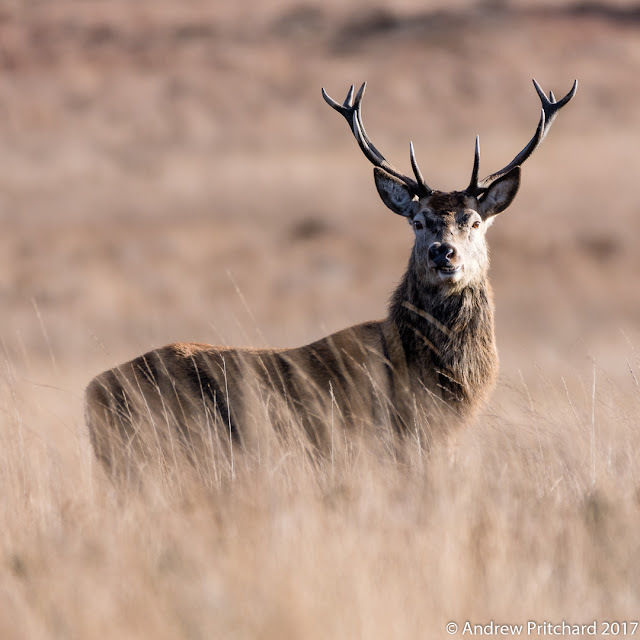 The stag continues to stare from his position in the long grass, which gives a slight hint of flames licking up his flank. The out of focus heather in the foreground, and middle ground grasses hide the legs of this large stag. His snout looks bovine, with a large wet nose looking very similar to a cow's. The big stags on the moor can reach the size of a small cow. What is coming this way? Two deer from a s small group of hinds grazing on the moor are studying something approaching nearby. Again, only one or two of the deer are wary, with others grazing on heather or even lying down ruminating. 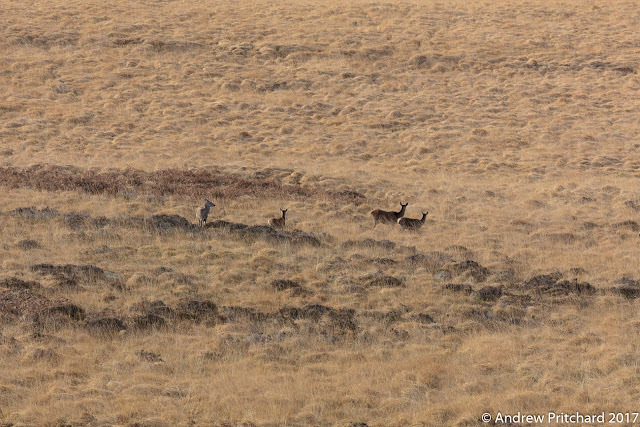 The two hinds are still looking intently to their left, with others still grazing or lying down as if unconcerned. A pair of ears can be seen sticking up between two of the deer who are grazing or standing up looking about. When too many deer are a little concerned, they whole group may decide to move on to somewhere quieter. The group does decide it is time to move on, leaving only one of the concerned individuals still looking disturbed. The stag and the rest of the hinds are wandering slowly away, still grazing as they go. The only hint that they are somewhat fazed is given by the way their ears are pointing backwards, perhaps listening for sounds behind them as they move away. It's early morning and a group of hinds move up on to the moorland to graze. 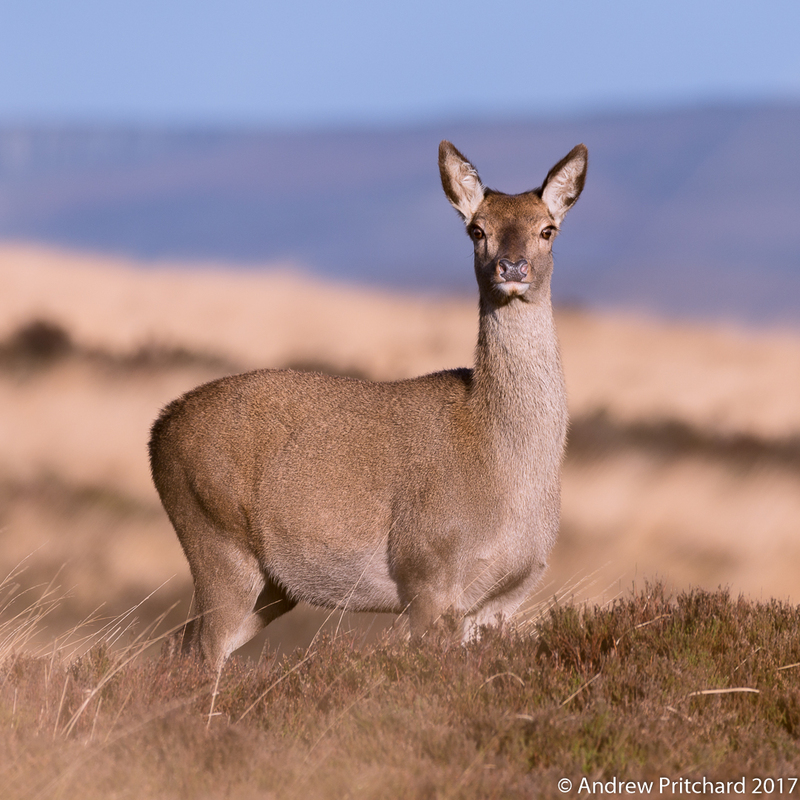 One younger looking hind seems to have spotted something sitting in the heather, not far from where the deer made their way up the edge from the woodland below. Others appear less concerned! 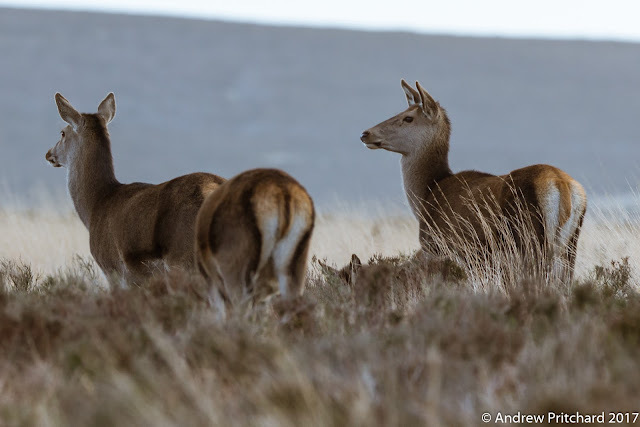 The older hinds walk slowly through the heather, unperturbed by any nearby activity. 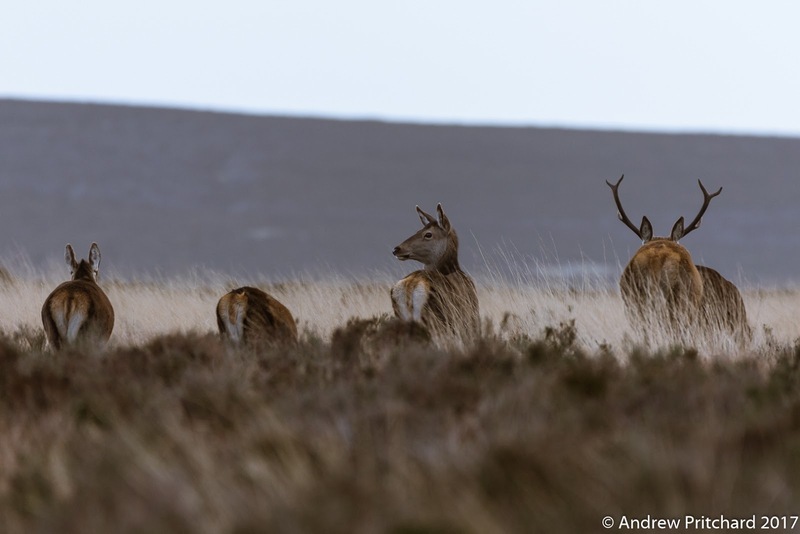 Just sitting or kneeling still in the heather can be enough for the deer to find a person unthreatening. Perhaps it experience that any seated animal is not a threat. If a person were to stand, the deer would immediately perceive a possible threat and run away. 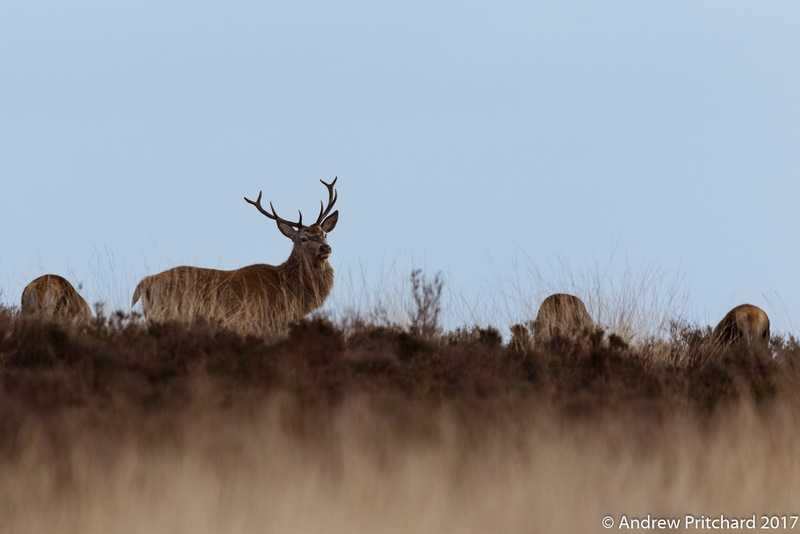 The younger hind still stands still, checking something in the nearby heather. Younger and less experienced in the ways of humans and interactions with deer perhaps, this animal is still concerned about a persons presence. The other deer have all walked on unconcerned, leaving this one behind. If there was indeed a threat from a predator lurking in the long grass or heather, this youngster's behaviour would have put it at risk. A young stag is caught mid-chew as he looks up. It may well be regurgitated grass or heather that he is chewing. 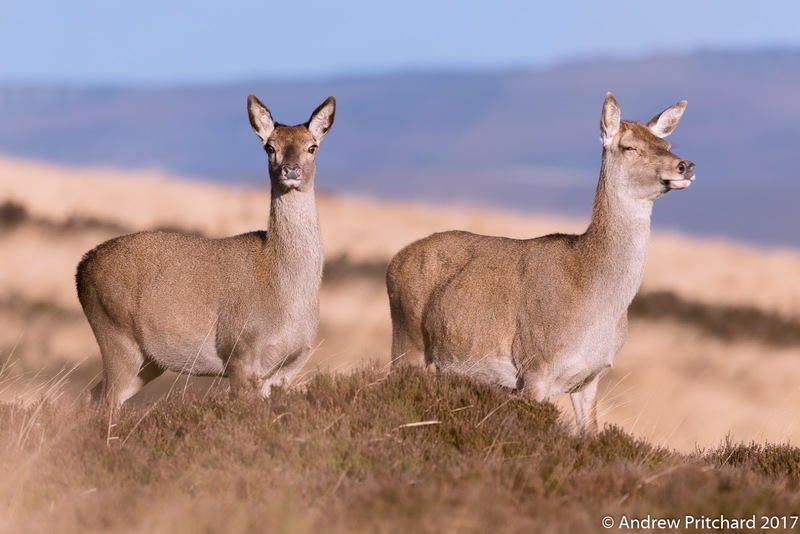 Normal behaviour is to graze extensively for some time, swallowing mouthfuls of grass or heather, then lie down to rest. The previously swallowed grass or heather is then regurgitated from the rumen and chewed further. 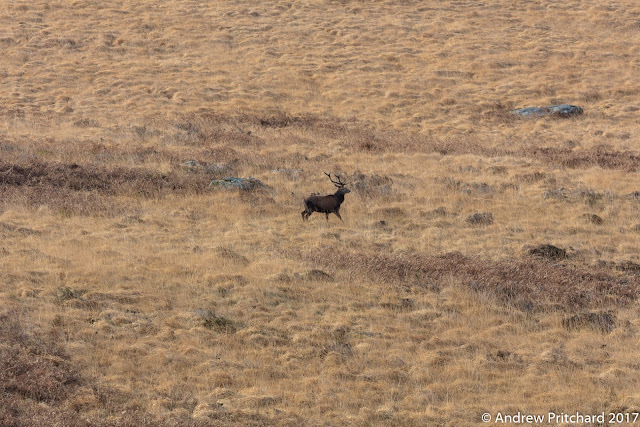 A stag walks purposefully through the long yellow grass and across the moor. The colouring of the winter coat on this animal is very similar to the colours in the surrounding landscape. If the deer remain still, especially if lying down they are very hard to spot amongst heather and grass. Often it is just the white fur on the rear that makes a deer visible. 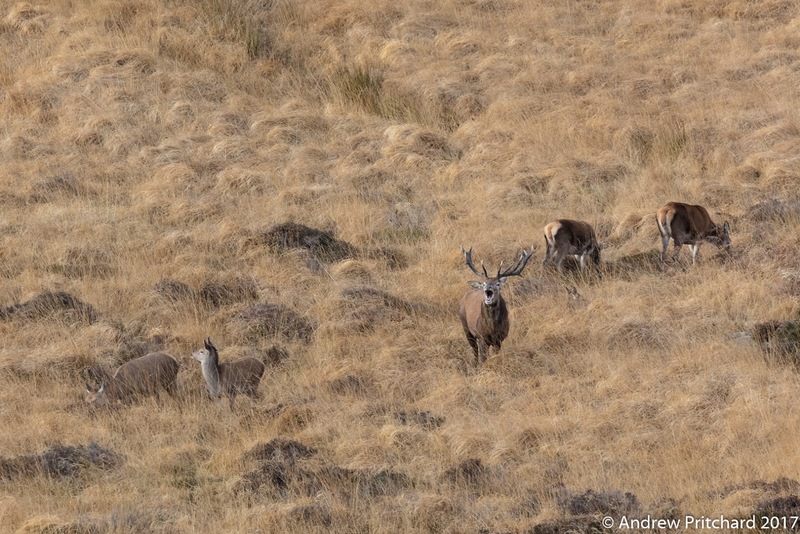 Grass, heather, and two stags. 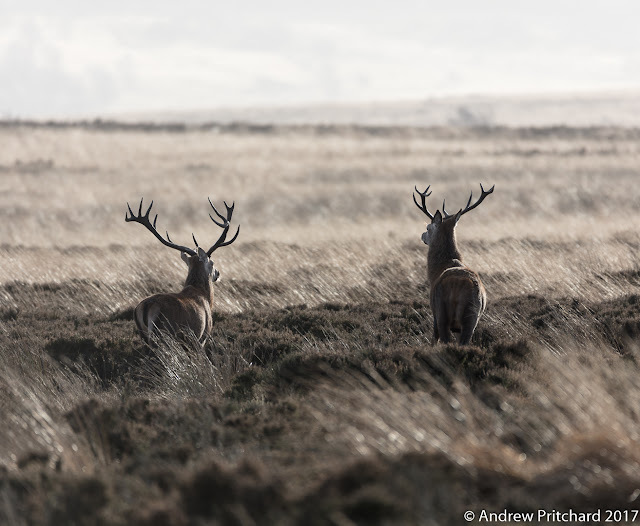 Two stags are walking away across the moor, passing through alternating bands of heather and grass. The winter afternoon sun can be quite low in the northern hemisphere. Go far enough north beyond the arctic circle and the sun will not rise or set for days, weeks or months during the winter. Here at around 53 degrees north on the planet, it remains low in the sky all day. One of the stags pauses whilst walking across an area of heather, looking to his left. 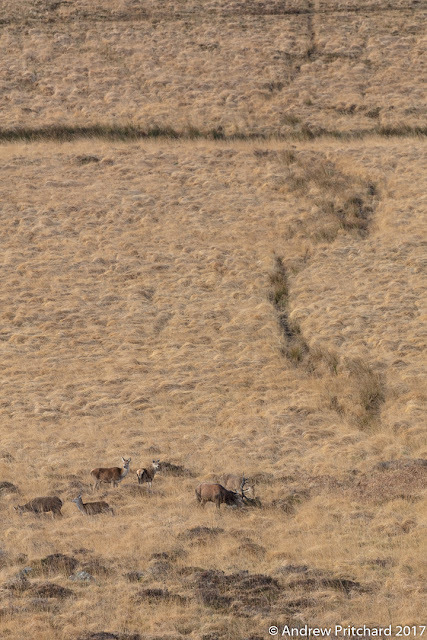 The low sun highlights the flank of the deer, and the wind blown angle of the grasses. The prevailing wind at this location is from the west, which is cause many of the flora on the moor to lean away from the west as it grows. Two stags pause whilst walking towards the sun. 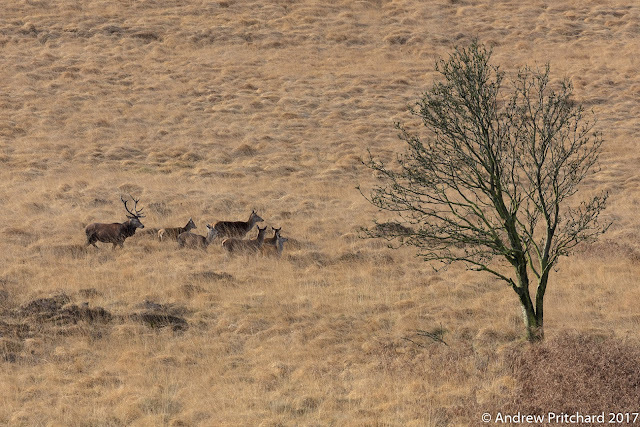 Mistiness can be seen in the distance, and together with the lighter colouration of the grass in the low sunshine, causes the deer to stand out as if silhouetted against a bright light. Sometimes they can be quite conspicuous too! If you would like to see more of the monthly posts from this blog, please subscribe using one of the buttons or links available. You can share this blog using the available buttons. 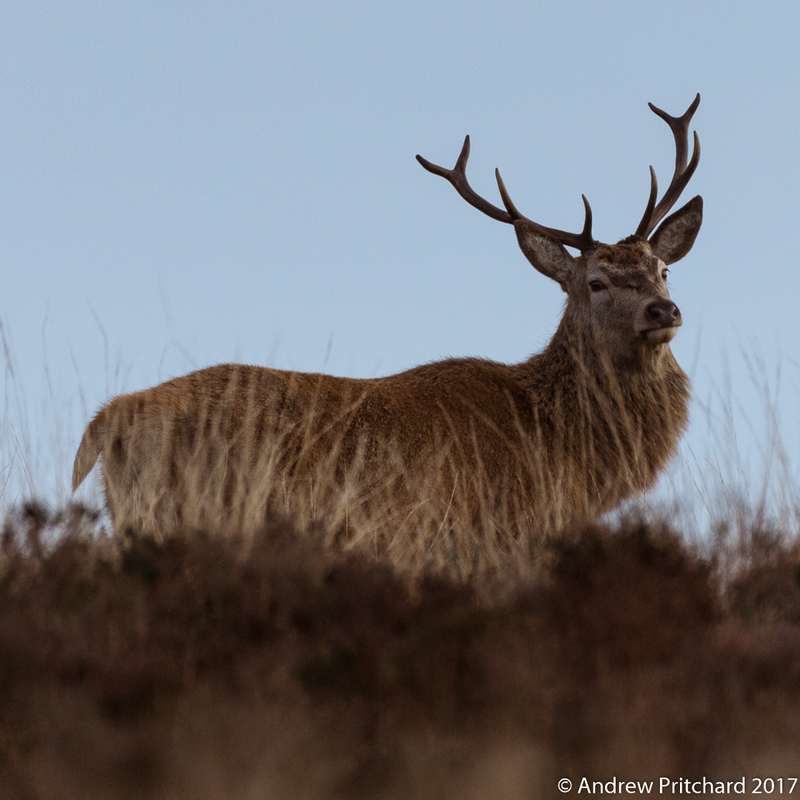 Each blog post will comprise a selection of pictures taken by the author, reflecting red deer activity for the month with some explanatory text.